Continuing with the week’s summary I’m already late to post the second one. The last week was very exciting as I saw opportunities to help another projects and attended to some entrepreneurial classes from MIT Solan School of Management. We also had a workshop with all researchers and visitors from camera culture group that helped me to keep chasing the application next year. At last the week didn’t end perfectly, there were some problems in the last days, but nothing big at all. The begining of the last week was much about VisionBlocks. I think there’s no reason to discuss project implementation here in the blog yet. We already have an outline to a paper and a deadline for subscription, so soon you all will read about it. Besides VisionBlocks, I tried to insert myself in other projects too. Offering help to Everret Lawson in processing the images acquired in his project of taking retina pictures. And also very excited with the possibility of helping Paulo Schor in a reserch project from UNIFESP for using eye moves to teach specialized motor actions. On thursday ( 09/27 ) I attended to Professor Joost Bonsen’s MIT Development Ventures and Neurotech Venture classes. Both of them seek an entrepreneurial approach with transformative innovations to challenges like hunger, poverty, illness (Development Ventures) and health (Neurotech Ventures). It worth saying that we tried this model of classes at IFPI with Professors Erick Passos, Ney Paranaguá and Fábio Gomes. Attend this classes here at MIT enthused me to try it again back at IFPI. 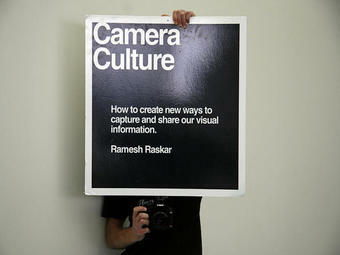 On friday ( 09/28 ) we had a workshop with all the researchers and visitors from camera culture group. This workshop was divided in two diferent parts. In the morning the new researchers presented their backgrounds, academic life and also actual projects and perspectives. Even the visitors had the chance to present themselfs and talk about their impressions. It’s amazing to see so many bright researchers from all around the world in a single research group. Each one using his background to improve other’s work. After this first part we had the lunch brake. We went to Media Lab’s garden to eat, talk about the presentations and also play frisbie and racketball. In the afternoon was time for Ramesh Raskar, camera culture director, give a talk about “Coming up with new ideias in imaging” and “Heilmeier’s catechism”. I already knew these talks (Erick has shown to his students in class), but they are good to see every once in a while so you can keep applying. Still in the afternoon Gordon and Matt (postdoc students) discussed life and research in the Media Lab / Camera culture, giving advices about “what is expected to you do”, “What is expected to you don’t do”, and also offered their help in any aspect we need. After the workshp we went to the Muddy Charles Pub to a happy hour. I didn’t last long there, the workshop gave me so much to think about.